All of my blanket ideas start with a brainstorm session of me and a stitch book. I love vintage stitch books, or any stitch book for that matter. I love to learn what the classic stitches of crochet are. I want to make sure I’m using the best name, or the most popular name, that a certain stitch is known by. I came across the EVEN BERRY Stitch in several of the books I own, so I am assuming that this is the generally agreed upon name, so I’m calling this a crochet even berry stitch blanket. This stitch itself is quite simple. It is a variation of a double crochet two together cluster type stitch. All you do is yarn over, (YO) insert your hook into the designated space, YO, pull through, YO, and pull through ONE loop on the hook. Then, YO, insert your hook into the same designated space again, YO, pull through, YO, and pull through all five loops on the hook. The stitch is complete. Now, in order to put the BERRY STITCH to work, you have to put it into some sort of pattern. Some books I consulted had you close the berry stitch with a CH 1. I do not have you do that in this pattern, but in case you wanted that look, you may choose to do that. The word EVEN comes from the fact that I will be having you stack the berries on top of each other in an even manner. So that’s a picture of my brainstorming. I decided that a mesh stitch, (which is alternating SC and CH) would really work well with this Berry stitch and help me to keep track of where exactly to place the berry. You’ll see when I explain in the pattern section. First, we must talk about this yarn I’m using! It’s called Bernat Roving. 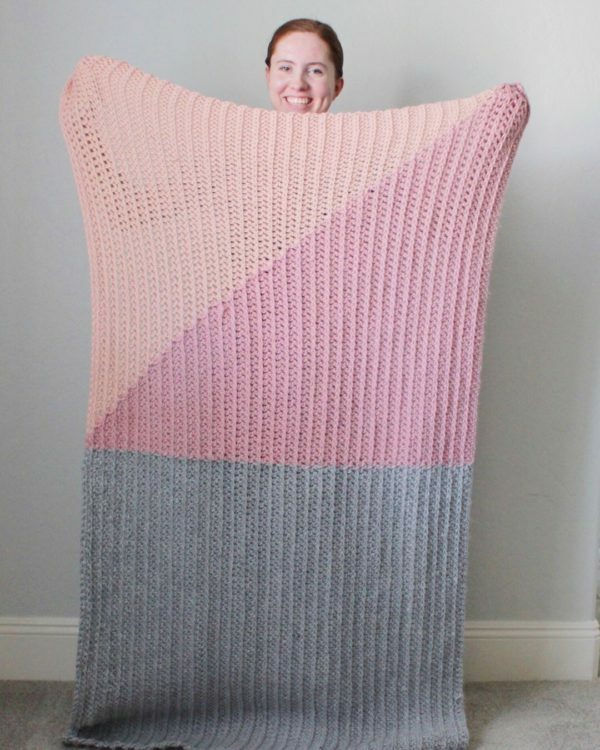 Now, I discovered this yarn last fall when my twenty-something daughter wanted a modern looking throw for her bedroom. She didn’t want me to use traditional yarn. She wanted the updated look she’d been seeing with those giant arm knitting blankets. You know what I mean, right? Well, Bernat Roving was a great option and got me the look without having to knit with my arms! Here is a picture of her blanket and click these words if you want more details. So when Yarnspirations asked me to design a blanket for them, I knew right away I wanted to give the Bernat Roving another test run! And I knew it would be so cozy for a January baby blanket. I didn’t mind having all this thick, chunky, luscious yarn in my lap either. Not one bit. Finished size is approximately 32 x 36 inches. It’s a great stroller size blanket. I will include a pattern repeat so you can customize it to the size you need. My guage was 16 chains equaled 7 inches. (Still trying to figure out how that all works.) I just like to tell you to practice first, and don’t do it too tight, and not too loose. Work with the hook sizes and see what you like. It’s just a blanket after all and not something you have to wear. Berry Stitch: YO, (yarn over), insert hook, YO, pull through, YO pull through ONE loop on the hook, YO, insert hook, YO, pull through, YO, pull through all five loops left on the hook. Berry complete. With Rice Paper, chain 70, or any even number will do. So if you want a bigger blanket, chain any even number. ROW 1: (MESH STITCH) In the second chain from the hook, work *1 SC, CH 1, skip 1 chain, SC into the next. * This is what is called a mesh stitch. Continue working across the whole length of the chain by alternating SC, CH, SC, skipping over a chain. You’ll know you did it right if you SC into the very last stitch. If not, go back and make sure you chained an even number, started in the second chain from the hook, and skipped over a chain everytime you made a chain. ROW 2: SC into the first SC, CH 1, SKIP over the Chain, SC into the SC of the row below. You are continuing to work the mesh stitch for this row. Same thing as row 1, you will end this row with a SC into the very last space. CHANGE COLOR to PUTTY by pulling through with the new color just before you finish the last SC. Then chain 1 and turn. ROW 3: (MESH STITCH) Work in the new color, one whole row of the mesh stitch. (That’s right, SC into the SC of the row below, chain over the chain space.) End with a SC, chain 1 and turn. ROW 4: (BERRY STITCH) SC into the first SC of the row below, now, instead of doing a chain, work a berry. Then work a SC into the next SC, a berry into the chain space. Alternate the SC and the berry stitch across the whole length ending with a SC into the last SC, but CHANGE COLOR back to Rice Paper, just before you finish working that SC and then CH 1 and turn. ROW 65 to the end of the blanket work rows 1-16 in the opposite order of colors. Start with Tidal blue, then Quartz Pink, Squashed, and end with Putty. Now, here is one last tip. When I was working the mesh stitch rows all in the middle of this blanket, I noticed my tension tightening up. So pay attention and keep it a bit looser. I think it’s because of the berries. They add a bit of bulk at the bottom. But after I blocked the blanket, it wasn’t a problem. Thank you so much for stopping by. I want you to know that I am simply sharing my love of crochet on my website. I picked up crochet after 20 or so years of not doing any, in hopes that I’d become a grandma. My oldest daughter has been trying for about 6 years now, and although my wish has not come true, I sure have loved practicing crochet and sharing all my patterns with you. I do my best to explain what I am making. Mostly I share a lot on Instagram. You can find me @daisyfarmcrafts. I share pictures as I work on each project. I also offer this exact blog post as a PDF Download for sale on Etsy if that is something you are interested in and would like. I appreciate you for purchasing. But I also appreciate you being here on my website too! I want to keep it as simple to navigate as possible. So if you do click around, just start at the menu and click a heading. I mostly make blankets, just started branching out to hats, and mittens and I love to make baby sweaters, I just am not the best at writing all that down. Getting there! Anyway, thanks for being my crochet friend.